My son Josh is not a picky eater. He’s always been good about trying new foods. If Josh resists eating something the problem he has is not usually with the taste or texture of something, but the smell. As a young adult Josh now manages most of his sensory problems with ease. He has discovered that he enjoys cooking and decided he needed to expand the number of recipes he knows how to make. I’ve taught him the basics of meal preparation, and I compiled a list of easy-to-prepare recipes that I thought Josh would enjoy making and eating. One such recipe was “Easy Lemon Chicken”. Josh would gladly consume the final, baked version of this dish. Unfortunately, and I didn’t know this about Josh, he can’t stand the smell of lemon juice. He’s fine with lemonade, lemon-scented soaps, cleaning wipes, and lemon jello. In fact, I can’t think of anything lemony that Josh reacted negatively to as a child. This experience revealed that there is something different and acrid for him about lemon juice and it was so hard for him to smell that concentrated lemon scent that he had difficulty just measuring it out to make the recipe. Adding to the challenge was Josh’s tendency to be impulsive, which of course is consistent with his ADHD diagnosis. With all the ingredients, even very common and frequently used ones, Josh automatically gives them a sniff before adding them to a recipe. He tells me he needs to check to make sure the smell is consistent over time and that things should smell exactly the same way each time or something seems wrong and he feels suspicious about that ingredient. In any case, sniffing food items is a well-developed habit by now, though thankfully not in public anymore. Josh gave the lemon juice a whiff, and had an immediate nose-wrinkling response followed by thrusting his arm as far from his nose as he could extend it. Blinking incredulously, Josh proceeded to…take another whiff from the bottle of lemon juice. Why? Partly due to impulsivity and partly due to his sensory system demanding consistency over time. He had to check again just to make sure it smelled as noxious to him as it had the first time. Yep! It still smelled awful to him, but at least he knew what to expect the second time. Predictability is comforting to the sensory-challenged. It helps to know what to expect, even if it is still an unpleasant sensation. Better the bad sensory experience you know than the unexpected sensory experience which could prove very unsettling merely by the unpredictability factor. Josh powered through the olfactory assault as he prepared the recipe, although it wasn’t as “easy” for him as the recipe name implied. The assignment was to write a story, using the words listed in the box. 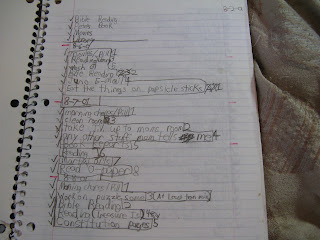 My children always preferred to come up with their own topics to write about, and being given a list of words was too limiting for them. My daughter clearly was not excited about this particular writing task. As do many students with ADHD (attention deficit hyperactivity disorder), she wanted to complete the assignment quickly so she could move on to more engaging tasks. She fit as many of the words as she could into the fewest sentences possible. She didn’t find a spot for one of the words in the box, but that didn’t bother her since she wasn’t interested in writing about those words in the first place. For the record, I am not the woman who was “scared of mice.” In fact, over the years we have had a number of rodent pets including hamsters and mice. I have presided over a number of shoebox burials befitting a rodent. One time I couldn’t come up with anything nice to say about Tommy, the misanthropic finger biter, who latched on to any hand with an evil mousy grimace. We had to wear thick gloves just to feed him and then we had to shake him off our hands when we were done. He leered menacingly all the time until I finally told the children to try to avoid looking him in the eye so he wouldn’t give them nightmares. The other mice and hamsters were decent pets, and were eulogized appropriately. As for the rest of the story above, I do live with my husband and children. At the time of this brief essay, my children were still young enough to be losing baby teeth and it was an event to be celebrated when another tooth became loose and fell out. Last week, I had part of a lower molar break off. Loosing a tooth at this age is no longer exciting. In fact, it’s downright disconcerting. I called my dentist at 8:00 a.m. the morning of Christmas Eve., since I was trying to be thoughtful and not disturb him when it happened the night before. I think I woke him up. I told him what had happened, and he didn’t seem to think it was an emergency. I wasn’t convinced, since it has been many years since I last lost a tooth and I didn’t anticipate losing any more as an adult. I’ve had what’s left of the tooth repaired, and was reassured that “sometimes with age these things happen.” Sigh. 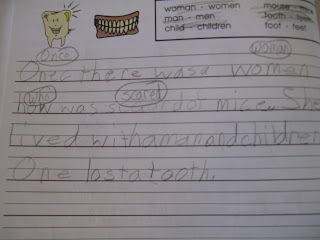 This homeschool flashback could have an interesting twist if it were written today – the children and the Mom could each lose a tooth! This is a busy time of year and there are many activities I greatly enjoy. Some of my holiday preparations are harder to fit into my schedule. Wrapping gifts is the one thing that I tend to put off. There are a couple of reasons for my gift wrapping procrastination. First of all, I need a cleared surface to work on in order to adequately wrap presents. I need to be able to spread out a bit so I can access and measure the paper, get to the scissors, and use the tape. Individuals with ADHD tend to see all flat, empty surface space as a good spot to dump their possessions. Finding an unoccupied area to use for wrapping is not likely to happen on the first perusal of my home. Then, once I manage to get a nice area cleared off it’s a race to see if I can use it before my husband, son, or daughter spot the flat, empty surface and cover it again. Another reason I put off wrapping gifts until I can’t avoid it any longer is the tendency of my inattentive family members to somehow notice what I don’t want them to see. How is it that they can step over a laundry basket that needs taken upstairs and not even notice it, but if I inadvertently leave something unhidden they spot it immediately? It’s one of those mysteries of life. I’ve made a great discovery, though, and it will work for birthdays and any other gift wrapping occasion. If I put a movie on for them to watch, I can wrap all the gifts while my family members are mere feet away! Amazing. Those who cannot sit still and pay attention during our homeschool day can actually hyper-focus on a movie. They become so engrossed in what they are watching that I think I could wear a tutu and stand on my head and they wouldn’t notice. As long as I am the least bit surreptitious I can position myself behind my kids and get all my gifts wrapped while we watch a movie together. This strategy would probably work with a good t.v. show, too. I’ve found that many individuals with ADHD become as engrossed in the commercials as the show itself, so you can continue wrapping away until you are finished. I tend to wrap a lot of gifts at one sitting, because once I have a work space and my children are occupied I take advantage of it. Now if only they needed as much sleep as I do, I’d be all set to tackle whatever comes my way! 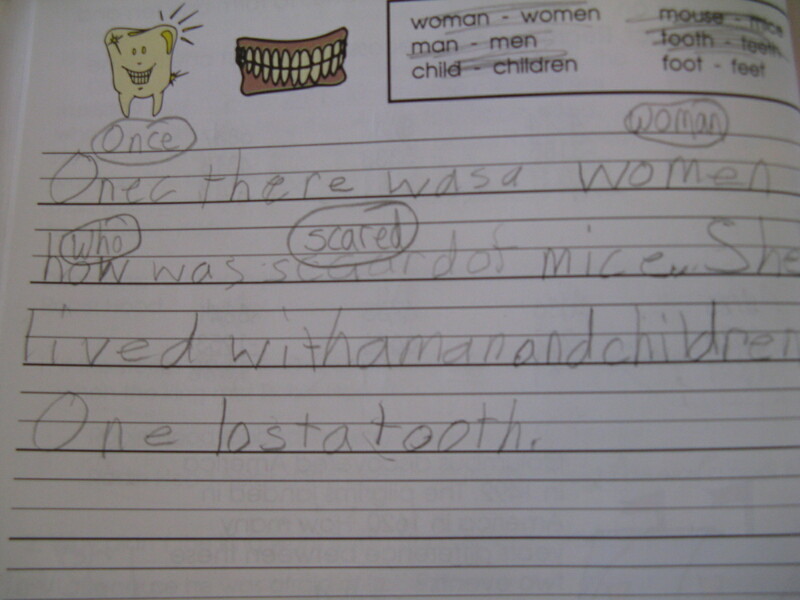 This was an assignment Josh did for a homeschool writing class. In addition to the ADHD, auditory processing, and sensory processing issues, Josh struggled with social nuances. Some of Josh’s struggles he understood and could identify. Other symptoms left all of us baffled, even Josh. I’m glad that even at this young age Josh knew he was smart and strong, so some of my truth messages were getting through to him in the midst of his challenges. 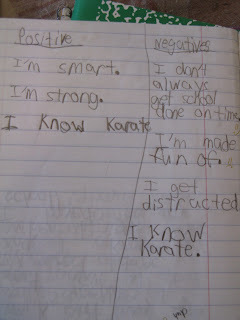 It’s interesting to me that “I know karate” made the positives and the negatives list. Knowing karate was good for Josh, in that it provided an outlet for his excess energy and helped him develop coordination and self defense skills. It also allowed him to be part of a group sport, but one that was individualized so he could progress at his own pace. 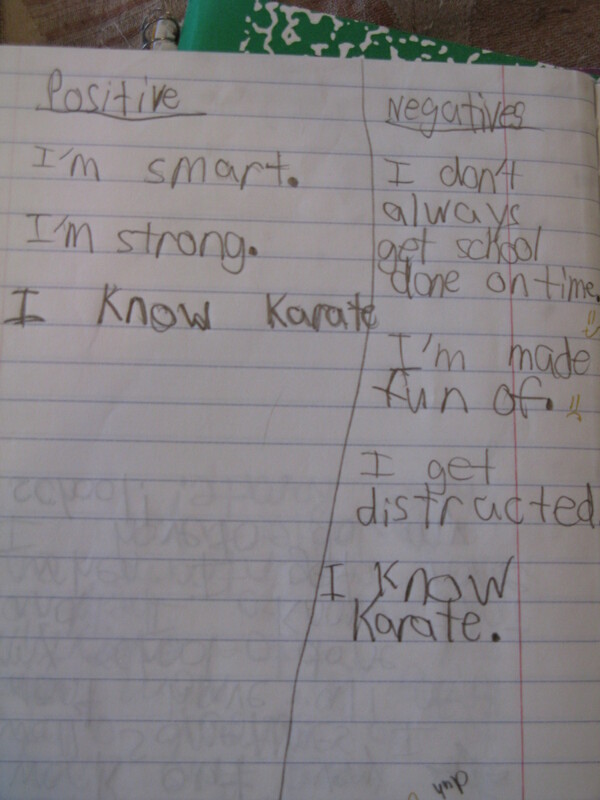 Knowing karate was a negative for Josh, because as soon as other kids found out he was training in martial arts they asked if he was a black belt and then wanted to take him on. Josh was never aggressive, so demonstrating his karate skills outside of class was not appealing to him. One of the first things most boys do in social settings is talk about their favorite sports teams and the sports they participate in. Josh was more interested in drawing and creating things than in sports, so he didn’t have much to talk about other than that he knew karate. This led to the inevitable challenges to prove his skills, which Josh did only when he absolutely had to for self defense. Even then, he ended the confrontation as soon as he could. 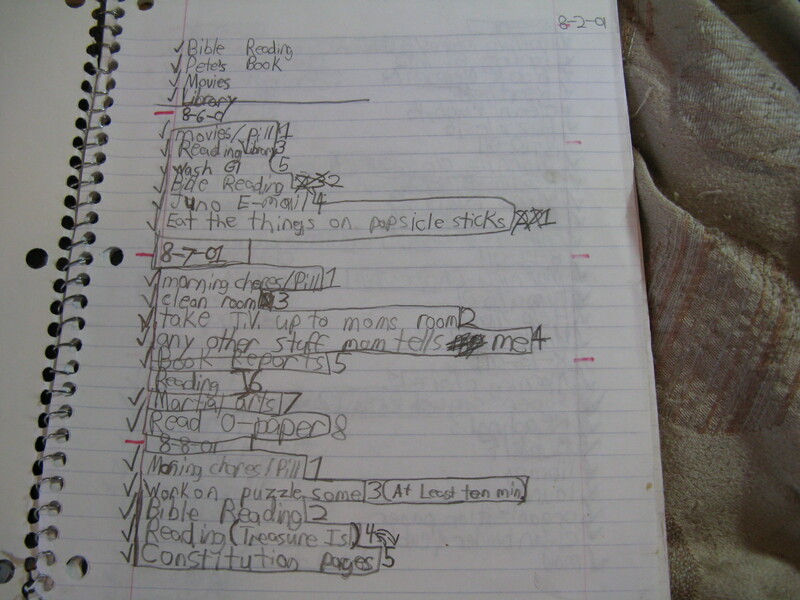 This homeschool flashback provides a snapshot of a young boy’s emerging self perception. Teaching him at home gave me the opportunity to help him develop a balanced view of himself, which is revealed by this writing assignment as he recognizes some of his strengths despite huge challenges. By the time Josh reached adulthood, he had a mental list of positive and negative things about himself that was accurate and realistic.